Lock in a great price for Holiday Inn Express Belem Ananindeua – rated 8.2 by recent guests! Great location near a shopping mall. Not every staff spoke English and that was not always workable. The hotel is very clean and organize, the internet is also very good, Friendly and helpful staff at Front Desk. very Nice Location.. Supermarket Castanheira was near. You can Find anything near to the Hotel. 24 Hours Taxi Available. It's a Holiday Inn, as good as the others I've stayed at. Particular mention goes to the excellent buffet breakfast! Location was excellent as I had things to do in Ananindeua, not Belem centre. Buses are readily available from right in front of the hotel if you don't want to use taxis; while Castanheira Shopping Centre is right next door & Belem Shopping Centre an easy 10 minute bus ride away. Location worked well, for our travel purpose. Friendly helpful staff. I was in transit in Belém with my 11-month-old daughter and we needed a place to rest. The place was just perfect. Located just a minute from shpping Castanheira. Room was clean and comfortable. 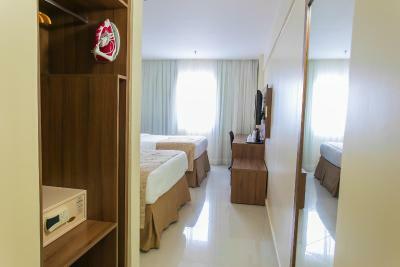 Friendly staff, clean rooms, very good bathroom / shower which is important in Belém! Amazing staff. Brand new facilities. Good breakfast with tropical juices. Transportation at the door for all around the town. A room has a pot, coffee and tea sets which is very rare to find in Belem. 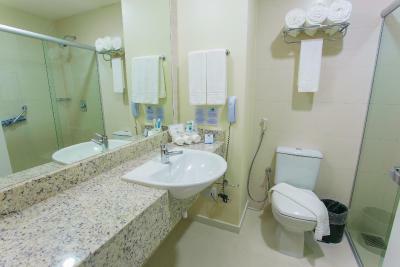 Bath amenities like toothbrush and shavings are also available if you request to the front desk. All the staffs are friendly and the staffs at front desk spoke fluent English. Location is also excellent just a couple of minutes from shopping Castanheira. 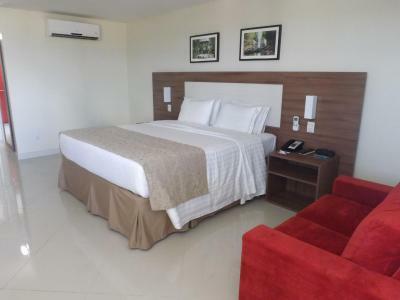 Holiday Inn Express Belem Ananindeua This rating is a reflection of how the property compares to the industry standard when it comes to price, facilities and services available. It's based on a self-evaluation by the property. Use this rating to help choose your stay! Holiday Inn Express Belem Ananindeua offers comfortable accommodations and modern facilities, as well as a 24-hour reception, a business center and laundry services. Elegantly decorated, air-conditioned rooms at Holiday Inn Express Belem feature a TV, mini-bar and private bathroom with a hot shower and hairdryer. The buffet breakfast offers a variety of tropical items. 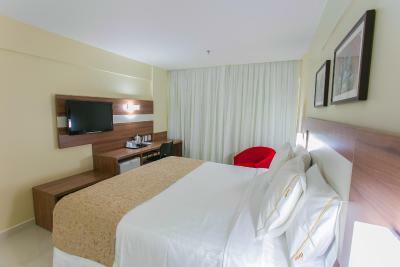 Holiday Inn Belem Ananindeua is 6.2 mi from downtown Belém and Paz Theater. Mercado Ver-o-Peso Market is also 6.2 mi away. Belém International Airport is 4.3 mi from the hotel. When would you like to stay at Holiday Inn Express Belem Ananindeua? With a king size bed, this air-conditioned room features a TV, mini-bar and private bathroom with a hot shower and hairdryer. This air-conditioned room features a 32-inch LCD TV, mini-bar, iron, and kettle. The private bathroom comes with a hot shower and hairdryer. This air-conditioned room features a 32-inch LCD TV, mini-bar, iron, and kettle. The private bathroom comes with a hot shower and hairdryer. The king bed is adapted to guest with limited mobility. Located in Belem, the city is considered the gate way of Amazon, has an interesting mix between a modern city and the rich neoclassical architecture. The Holiday Inn Express Belem-Ananindeua, is located at BR 316, main entrance of Belem, a region booming, close to the Castanheira Mall and industrial district of Ananindeua. With easy access to the airport, Hangar Convention Center and the major companies operating in the region. The main turistics points of the city are less than 10 kilometers from the hotel, including the Da Paz Theatre, Ver-o-Peso Market, Mangal das Garças Ecopark, “Polo Joalheiro” and “Estação das Docas” (Docks Station) with pubs, cafes and restaurants with the best of Pará cuisine. House Rules Holiday Inn Express Belem Ananindeua takes special requests – add in the next step! Holiday Inn Express Belem Ananindeua accepts these cards and reserves the right to temporarily hold an amount prior to arrival. In front of the hotel was flooding and that makes it difficult to walk to the hotel. A critical wi-fi network, unstable. Room and common areas cleanliness need to be improved. Having the hot water for shower a bit hotter would have been nice. breakfast was not bad but not good as I had expected. It is very expensive to locomove through the city. Basic breakfast, could include some more options. However, the staff made tapioca on request. View from the room on the parking lot, even if I asked for a room with a better view. No restaurant inside the hotel for Lunch and Dinner. TV didn't have anything to offer for international guests.